After joining SoundCloud in 2012 to grow adoption + usage of the audio platform on mobile devices, I slowly realized that, even at this cutting edge, tech-driven company with an incredible team, there was little familiarity with the concept of data-driven experimentation in digital products. Furthermore, there was little knowledge of mobile outside of the nascent iOS and Android teams. Like most products that were formed in 2008, SoundCloud was built web-first, with mobile apps developed later. 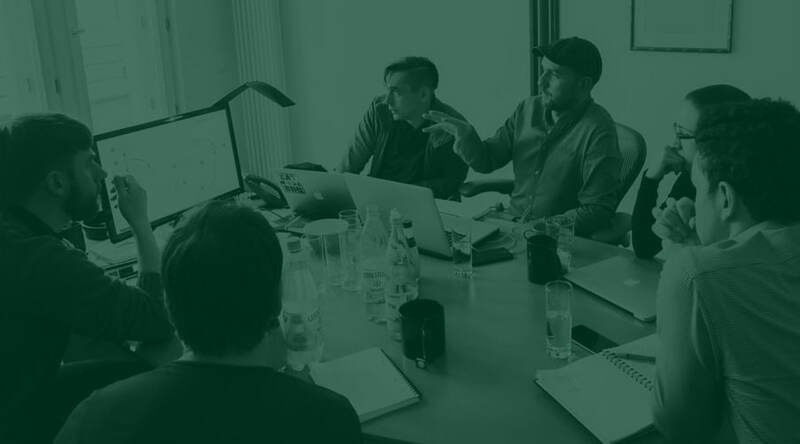 It swiftly became apparent that a key challenge in the role would involve educating the organization, making the case for mobile growth and helping my colleagues and leadership team to understand what mobile growth entails. My fear was that, without understanding and buy-in and from above, mobile would remain an afterthought and would remain under-resourced as the market shifted inexorably and in increasingly quickly toward mobile. The essential design layout hasn’t changed much over time, although the framework itself has filled out. There’s a foundation layer at the bottom of ‘world class analytics’ – my nod to the idea that systematic growth cannot be implemented or improved meaningfully without proper measurement and instrumentation. The three horizontal rows above analytics correspond to three key funnel steps or business objectives (acquisition, engagement+retention and monetization), each of which will have their own KPI targets and possibly their own teams, but are also fundamentally connected as part of a larger system of growth. Finally, I included international efforts as a vertical pillar that cut through the aforementioned layers, since strong international growth efforts are likely to multiply impact across all of these areas. This visual always seemed to attract attention, both within SoundCloud when presented at leadership meetings, or in the ‘Mobile Business 101’ class that I taught at General Assembly in Berlin. 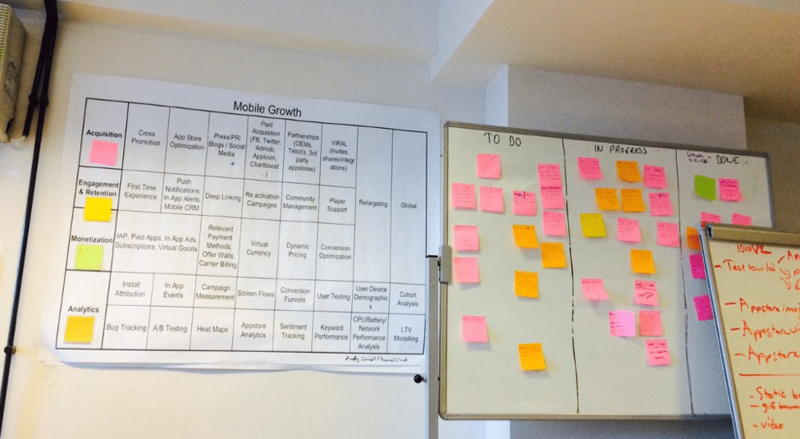 At the latter, when I noticed the class taking photographs of this slide, I started to suspect that it might be more than just my employer that would benefit from a framework to demystify mobile growth. Inspired by this early positive response, I developed the idea further and presented this version at App Promotion Summit in Berlin in November 2014. 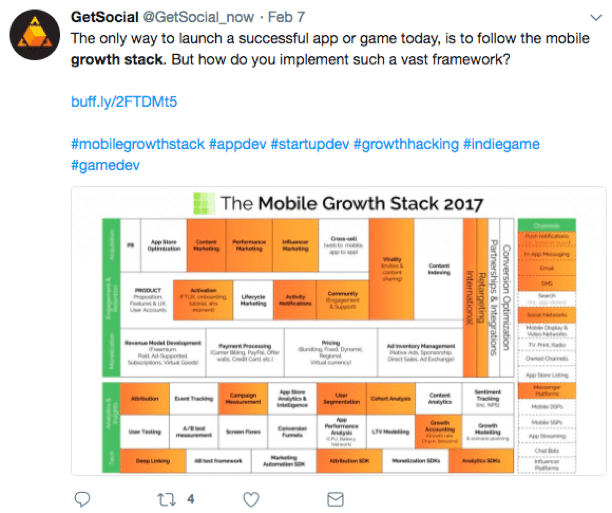 The same day, I published the original Mobile Growth Stack article on Medium, making the case for a framework for strategic mobile growth. 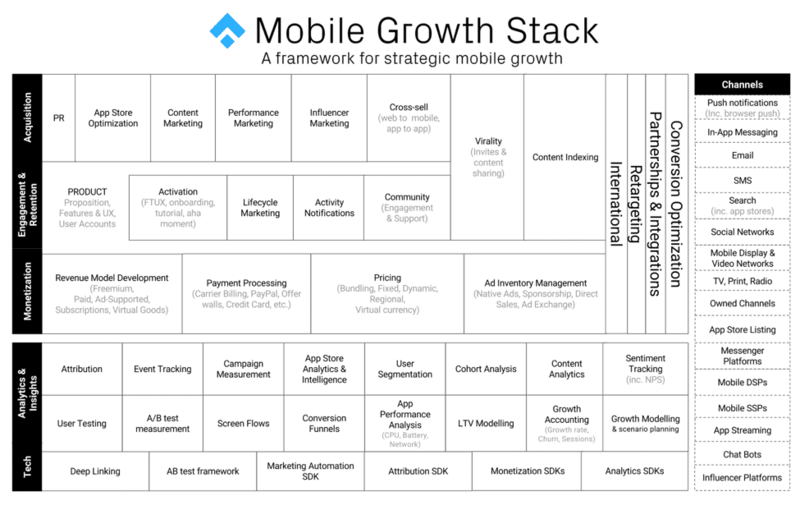 When I first published the Mobile Growth Stack in November 2014, I could not have predicted how far this blog post would travel and how widely the framework would be adopted. I had added significant detail to the Analytics layer, including the various types of measurement, data collection or analysis that were relevant to mobile app growth topics. I also put some more thought into the three main layers and added retargeting as a second vertical column. 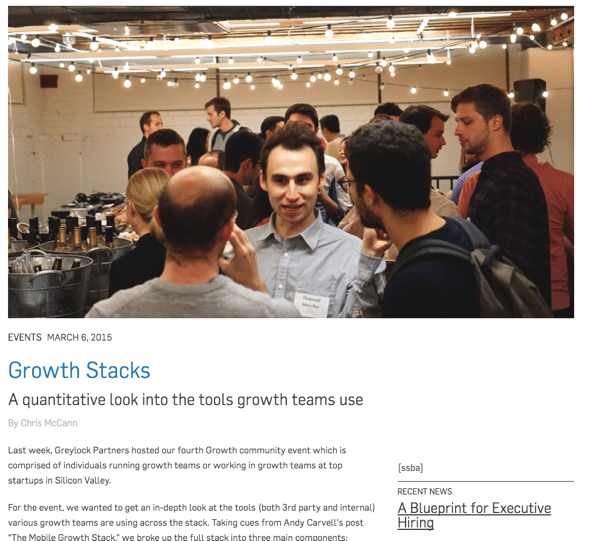 The blog post was widely adopted and shared; it seemed to resonate with the startup world: CEOs, Product Managers, Marketers, Data Scientists and Investors alike got in touch with me to share their tales of how useful the framework had been within their organization and how they were using it to get more strategic and focused with their mobile growth efforts. 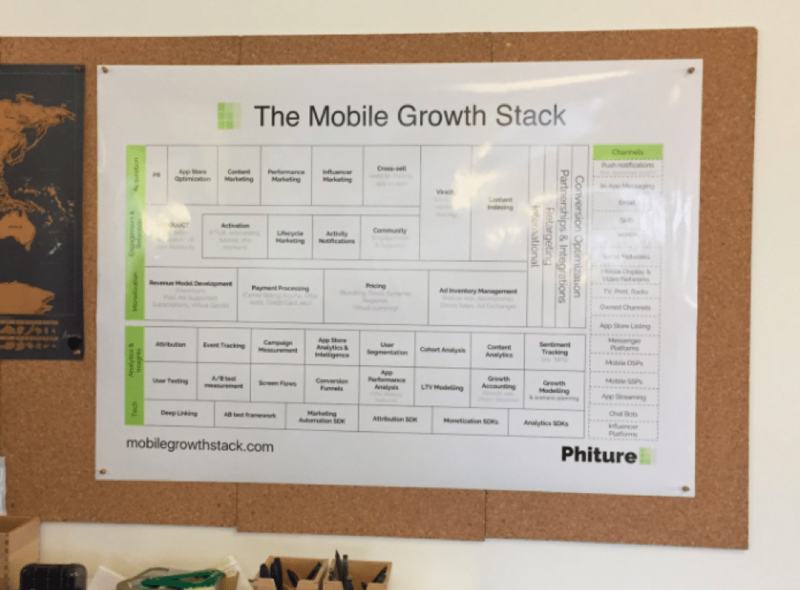 I released a second version of the stack at the end of 2015, this time with input from my colleague and friend Moritz Daan, with whom I would go on to co-found Phiture — our Berlin-based mobile growth consultancy — in late 2016. In this version, I was keen to separate Channels (broken out into a separate section) from Activities (the cells in the main layers), since it’s not just about selecting the right mix of activities, but about finding the right channels to use in conjunction with these activities (for example: lifecycle marketing may really take off in terms of impact when the right mix of push, email and in-app messaging channels is applied). The latest version of the Mobile Growth Stack incorporated a round of updates for 2017. We expanded the Channels section to include Mobile DSPs and SSPs, as well as emergent growth channels such as ChatBots and Influencer Platforms. We added a tech layer, registering the importance of getting the right tech fundamentals in place in the app to enable delivery and measurement of growth initiatives. We also made some adjustments and additions in the main layers of the stack, based on an increasing body of experience at Phiture, helping companies across a range of app categories grow their apps. It’s also great to see the framework so widely adopted, to the point where we see great presentations at conferences and social media posts from industry peers who are using the stack in their work. 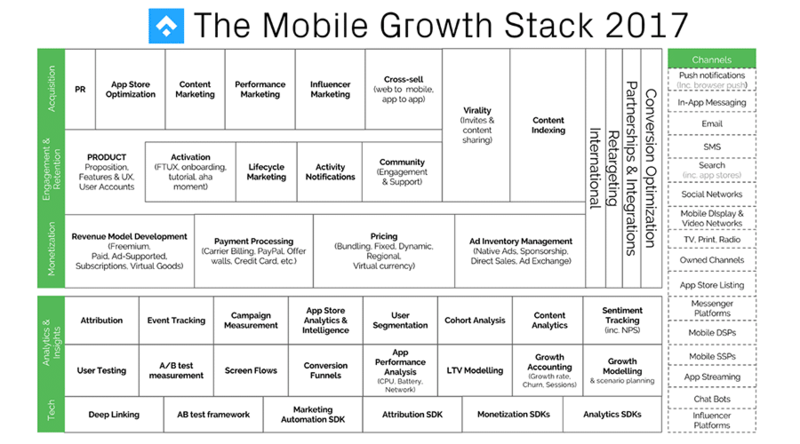 What’s Next for the Mobile Growth Stack? 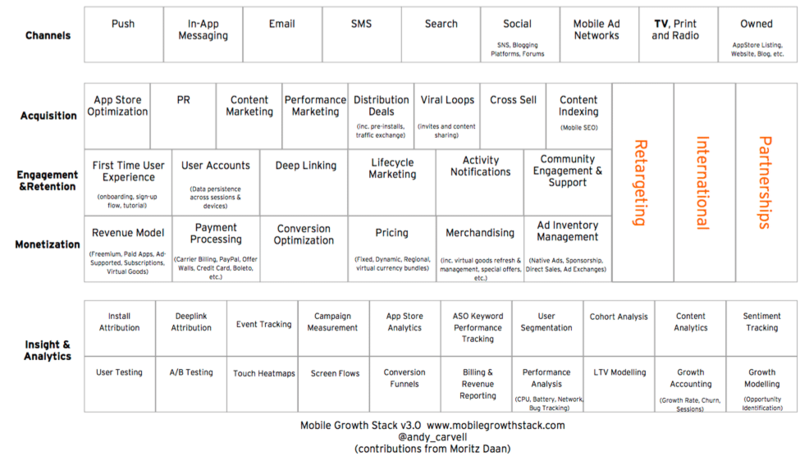 Since the initial version in 2014, the Mobile Growth Stack has grown in complexity mirroring the growth of the mobile ecosystem. However, the increased level of complexity is something that I’m not entirely happy about. Ideally, the framework should be as complete as possible (i.e. 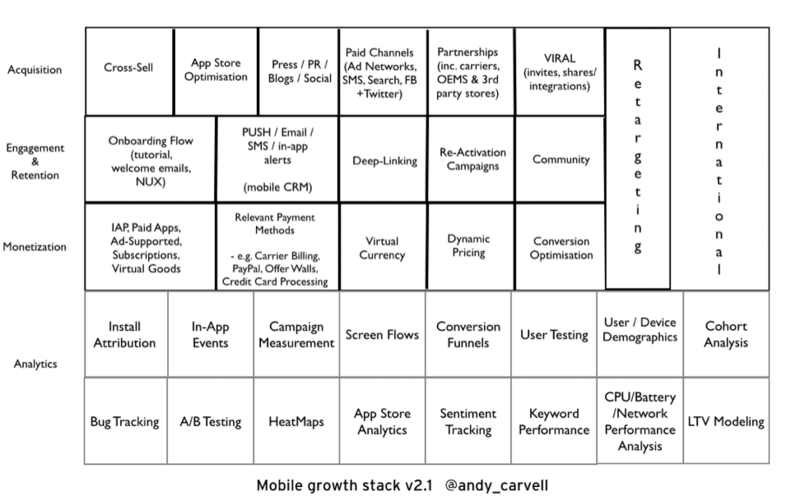 encapsulating the activities and channels that are relevant to mobile growth) while being minimally complex. The last couple of iterations have traded some simplicity for completeness, which I think was the right balance; the 2017 edition was definitely the most comprehensive to date and still feels pretty complete in terms of its content. Also in 2017, we spun off the App Store Optimization complex and created the standalone ASO Stack, which covers this topic in depth. In 2018, we will make some minor adjustments to the content to ensure maximum relevance and, where possible, remove or combine some elements to reduce complexity. The main revision, however, is likely to be in terms of the organization of the information; we’re exploring ways to make the stack more accessible or easier to read from a visual standpoint. 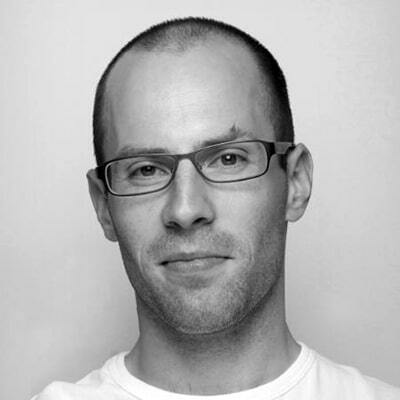 Andy is a former game developer with an MBA and combined interests in technology, business strategy and frameworks. Between 2012 and 2016 he led several data-driven growth teams at SoundCloud. 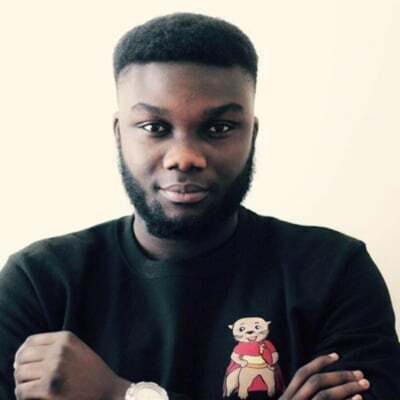 He now helps Phiture clients with growth strategy. "Great event with great people. Not only were we able to meet quality forward thinking customers at the event, we also made some personal friends who were able to help us understand the mobile app ecosystem even better. Will be attending the event again." "App Growth Summit keeps the bar high and delivers true value to attendees. AGS Berlin was one of the best events of the year, in terms of the content and great networking opportunities."